The grown-up version of our Young Amelia Pond mocktail, this hearty cocktail walks the line between savory and sweet, is both exotic and familiar, and seems at all times to be both a simple drink and a complex cocktail. Fill a collins glass with ice, add all ingredients, stir, and garnish with a cherry. *Because our cocktails are geared towards an affordable budget, this cocktail was created using Bundaburg Ginger Beer and Dewar’s White Label (blended Scotch). Different scotches will give different flavor profiles, as will various brands of ginger beer. If you prefer cheaper, more readily available ingredients, this drink can be made with ginger ale (Canada Dry or other) and Rose’s grenadine, although a higher quality grenadine (Small Hand Foods or similar), scotch (eg. 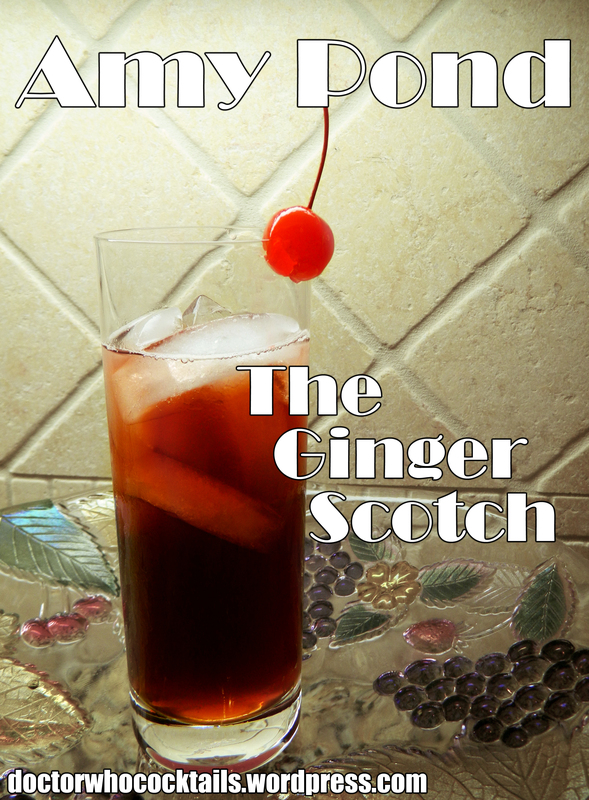 single malt scotch), and ginger beer will give the drink a more refined palate. We encourage you to experiment until you find the combination that works best for your tastes, although we DON’T recommend using your expensive scotch in this drink – as James Bond said, that’d be a waste of good scotch. 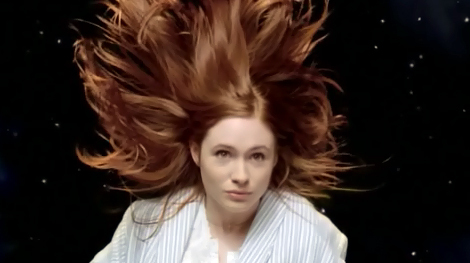 Amy Pond is a feisty red-headed Scot played by Karen Gillan. A companion of the Eleventh Doctor, she first meets him as a seven-year-old when he crashes the TARDIS in her backyard. She asks to travel with him and he promises her that he’d return in 5 minutes. Twelve years later, he finally returns, but young Amelia now goes by Amy and is engaged to be married after a childhood of convincing herself that The Doctor wasn’t real. Once again she decides to travel with him, and throughout her many travels she gets married and has a daughter, although, well, it’s not quite as simple as all that. She finally leaves the TARDIS to live a normal life with her husband Rory in New York City. She traveled with Doctor from 2010-2012, until her departure midway through Series 7. With a rich flavor and a clean finish, this gingery mocktail will make waiting for your “imaginary” friend all the more bearable. Add all ingredients to a glass filled with ice, stir, and serve. 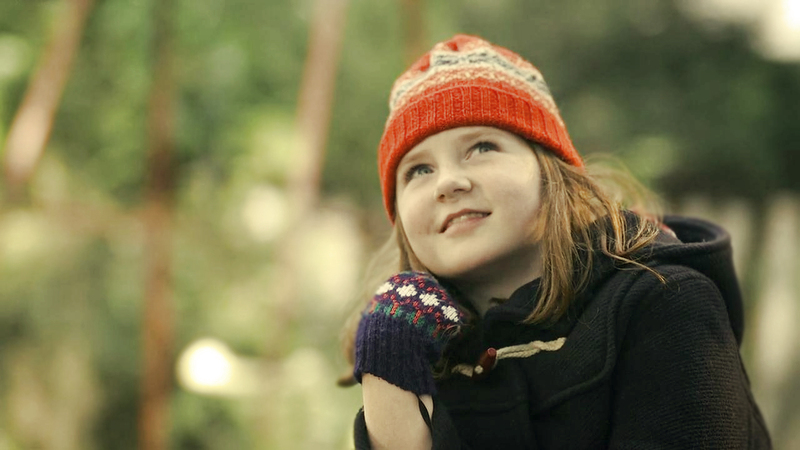 Young Amelia Pond is a fearless redheaded Scot portrayed by Caitlin Blackwood. Seven years old, she is first visited by The Doctor immediately following his regeneration from his 10th to his 11th incarnation after the TARDIS crash lands in her backyard. When he leaves to investigate an alert from the TARDIS, she puts on a hat and mittens, packs a bag, and waits for his return–a bit longer than anticipated. Young Amelia Pond only encounters the eleventh incarnation of The Doctor, and doesn’t travel with him until she’s grown into a 19-year-old on the verge of being married. 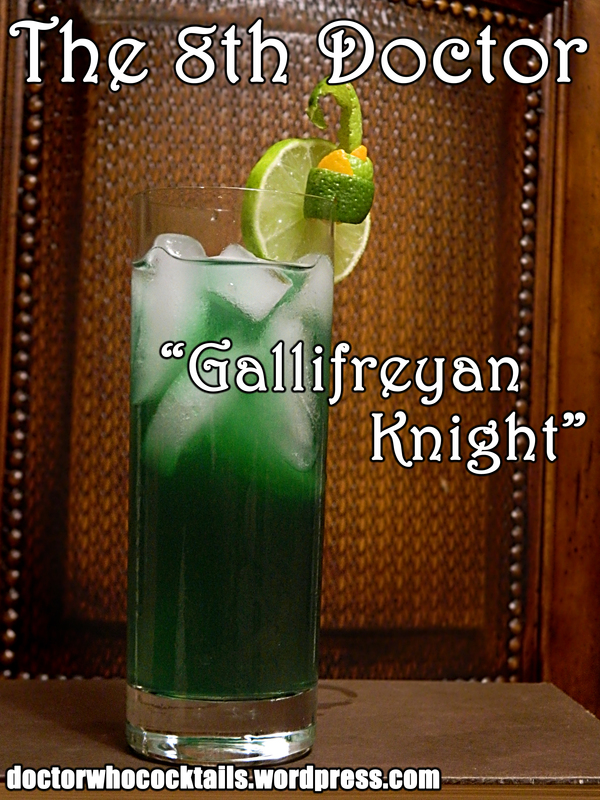 This sweet, simple drink is the perfect companion to our First Doctor cocktail, holding onto that mysterious unearthliness, while still being a beautiful addition to your cocktail repertoire. Add all ingredients to a shaker filled with ice, shake well, serve up in a chilled, stemmed cocktail glass. 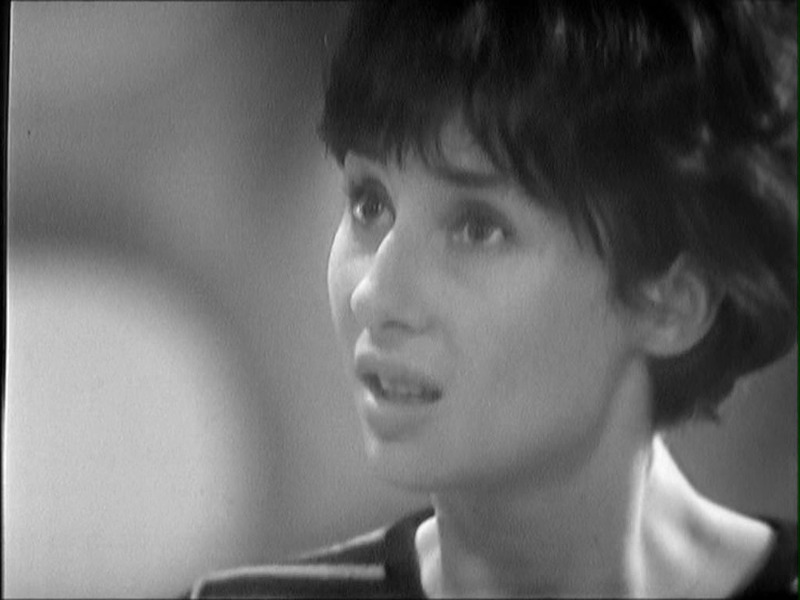 Susan Foreman holds the distinctive honor of being the very first Doctor Who companion, and was portrayed by Carole Ann Ford. As The Doctor’s granddaughter, they stole the TARDIS together and traveled the stars. We first find them stationed in a junkyard called Totter’s Lane in London in 1963, where Susan attends the nearby Coal Hill School. Her unearthly knowledge of mathematics and history intrigue her teachers Ian Chesterton and Barbara Wright, who follow Susan back to Totter’s Lane and force their way into the TARDIS against the wishes of The Doctor. Together they go on many adventures through space and time. 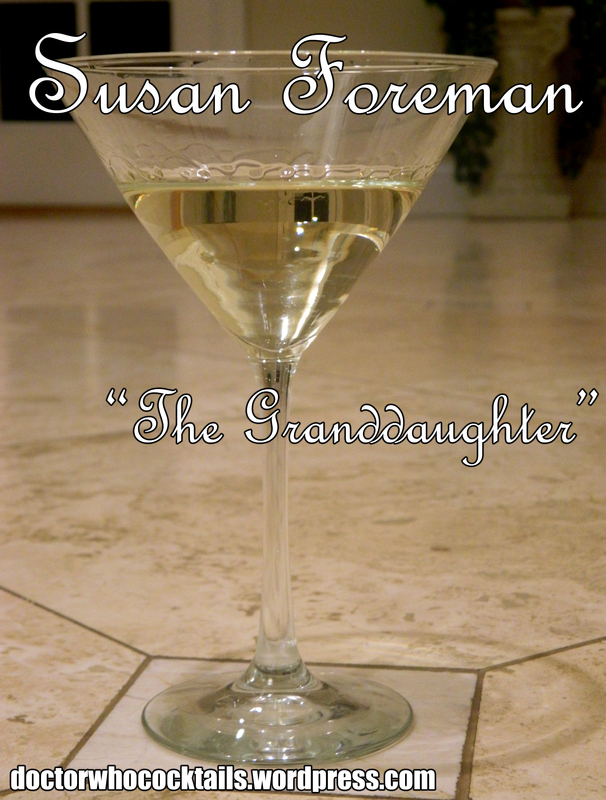 Susan encapsulated the teenager of the 1960’s, a “modern woman” with a short black haircut and a hands-on attitude. In addition to being the first companion, she also invented the acronym “T.A.R.D.I.S.,” can fly the TARDIS, and was the first character to leave the program. Susan flew with The Doctor since the first episode in 1963 until 1964, two stories into the show’s 2nd season, when she falls in love with 22nd Century freedom fighter David Campbell. The Doctor realizes that Susan deserves a life of her own and locks her out of the TARDIS. To this day, her departure is considered one of the memorable moments in the show’s history. She appeared once more in the 1983 special The Five Doctors as well as the 1993 charity special Dimensions in Time. This bright, clean drink begins as a plain champagne, and gradually evolves into a crisp cocktail with a refreshing finish. Fill bottom of champagne flute with Hpnotiq. 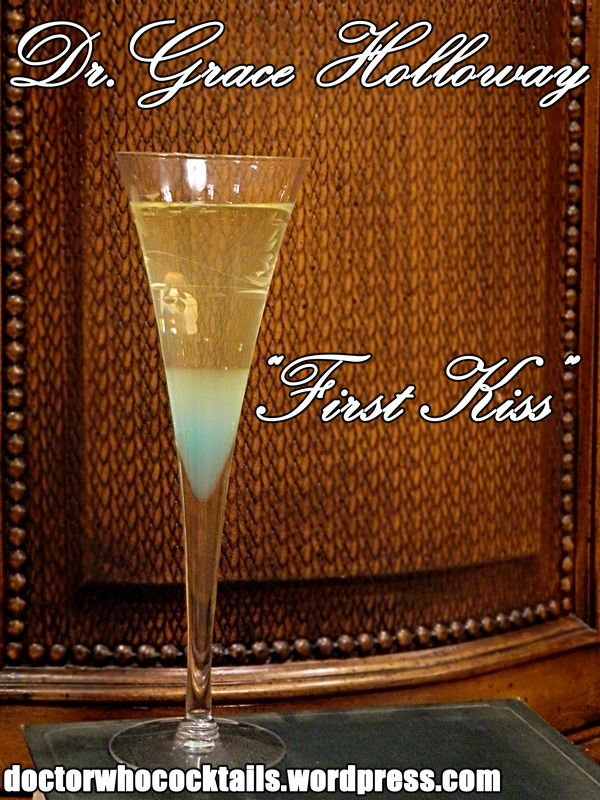 Using a spoon, very carefully layer the champagne of your choice on top of the Hpnotiq and serve. 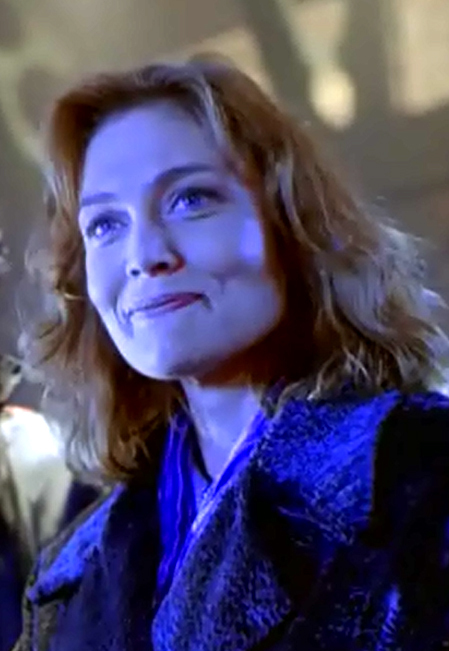 Dr. Grace Holloway is the senior cardiologist at a San Francisco hospital and portrayed by Daphne Ashbrook. She first encounters the seventh incarnation of The Doctor when she is asked to perform an emergency operation on him after he is shot by gangsters. Upset that she loses him, she is slow to believe him when his eighth incarnation tries to convince her that he is alive, and an alien with two hearts. After an adventure that includes being possessed by The Master, dying, and being revived by the TARDIS, The Doctor offers to take her along through space and time, which she declines. Dr. Holloway is a warm, compassionate person who has always wanted to hold back death, and finds new faith in herself through her time with The Doctor. Dr. Grace Holloway appears only in the 1996 TV Movie, where she spends most of her time with the eighth incarnation of The Doctor. She holds the distinguishment of being the first companion to kiss The Doctor. 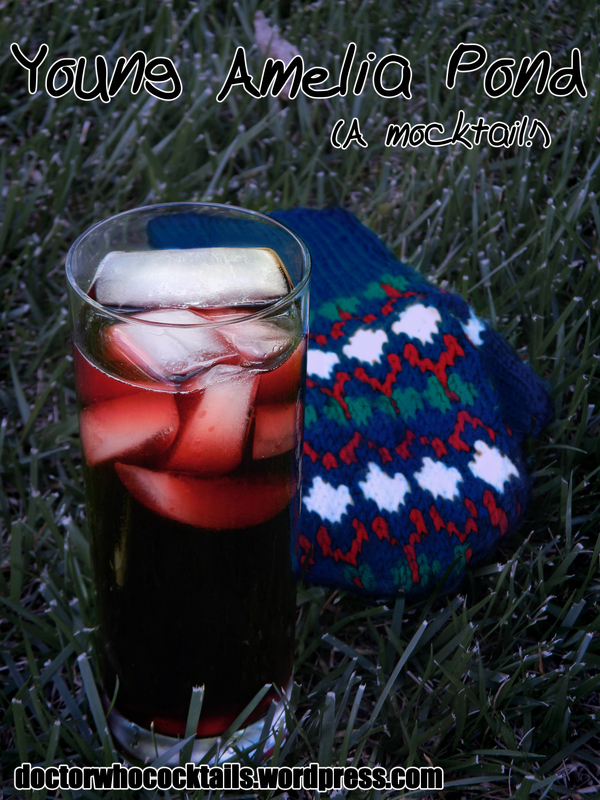 This smooth concoction is a hearty and quirky cocktail, perfect to bring out at parties or for unwinding after a long day. Add all ingredients to a mixer filled with ice, shake well, serve up or on the rocks in an old-fashioned glass or Collins glass, respectively. Garnish with a lime wheel and a lime/orange twist. 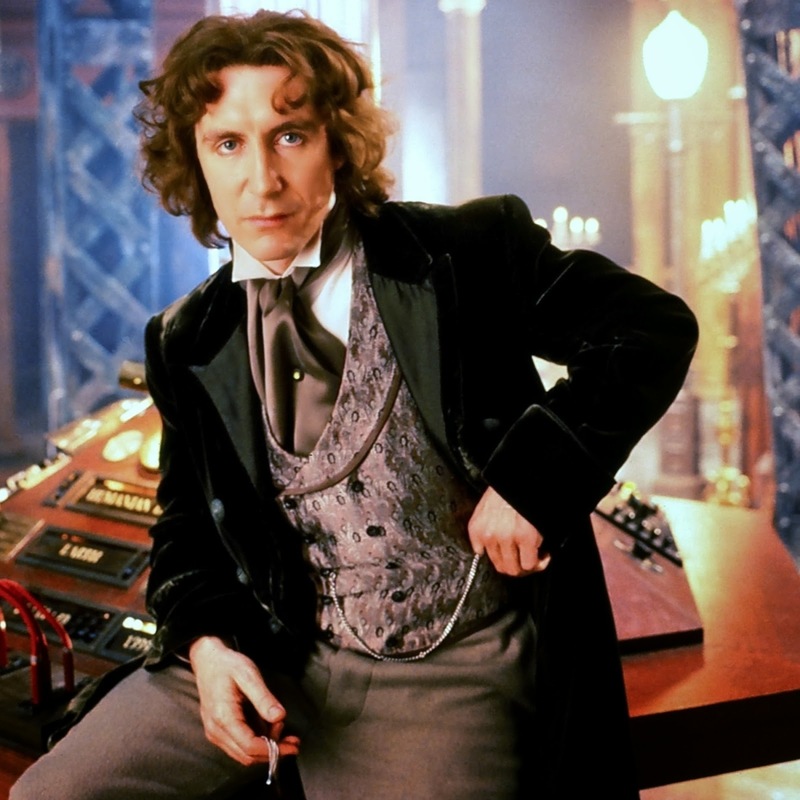 The eighth incarnation of The Doctor was portrayed by Paul McGann. Suave and eccentric, yet prone to bouts of amnesia, the eighth incarnation of The Doctor is a passionate adventurer and the first Doctor to have romantic relations with his companions. His first appearance on the show was in the 1996 TV Movie, which was intended as a backdoor-pilot to revive the series from ongoing hiatus since 1989. 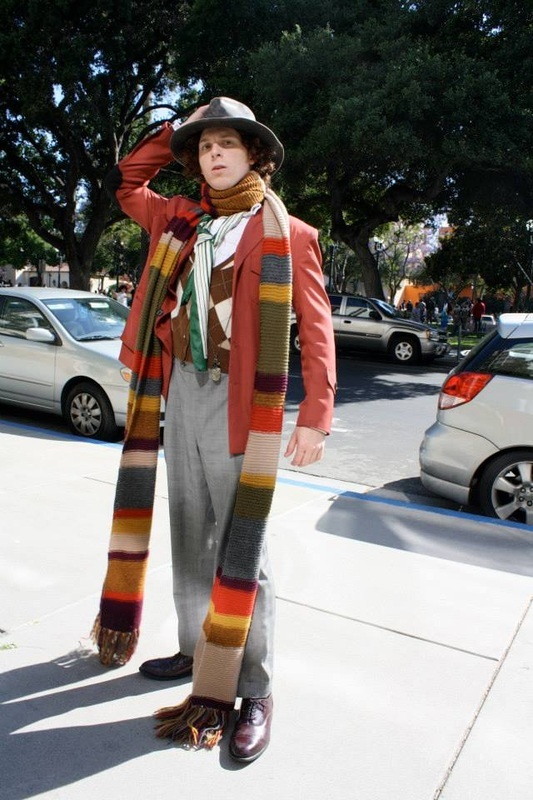 The movie was unsuccessful, therefore when the show was finally revived in 2005 The Doctor had already regenerated into his ninth incarnation, and until 2013 this was the only television appearance of the 8th Doctor. In 2013, the eighth incarnation of The Doctor reappeared onscreen in the mini-sode “The Night of the Doctor,” when he reappears as a weary pacifist, worn down by the effects of the Time War, despite his refusal to participate. It is there revealed that the incarnation portrayed by Christopher Eccleston is not the true ninth incarnation, and between those bodies he did finally fight as a soldier in the Time War. Despite his lack of television appearances, the 8th Doctor’s adventures are heavily documented in BBC Books’ novels and Big Finish Productions’ audio dramas, as well as other spin-off material. Although the canonicity of the spin-off material is debated, his salute to former companions in “The Night of the Doctor” suggests that the Big Finish audio dramas are considered the “canon” stories. As such, his “official” companions are Dr. Grace Holloway (TV Movie), Charley Pollard, C’rizz, Lucie Miller, Tamsin Drew, and Molly O’Sullivan (all Big Finish Productions). 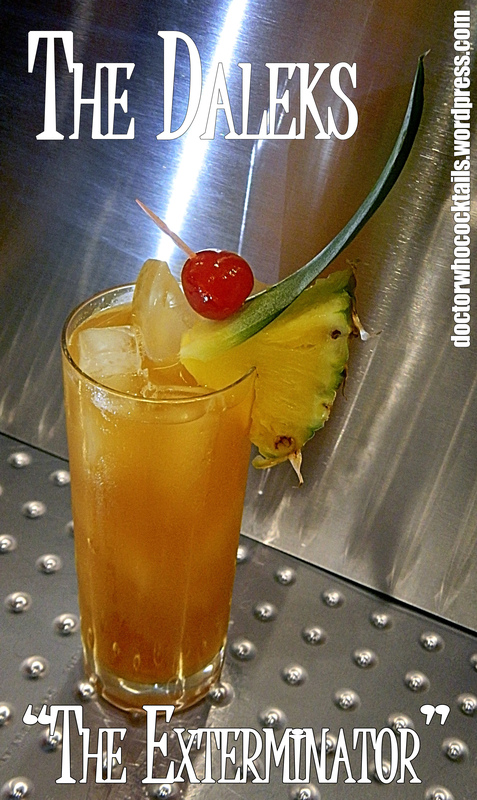 This new twist on an old idea is just what Dr. Song ordered – its rich floral bouquet heralds an incredible depth of flavor with the fun flair of a devilish bite. 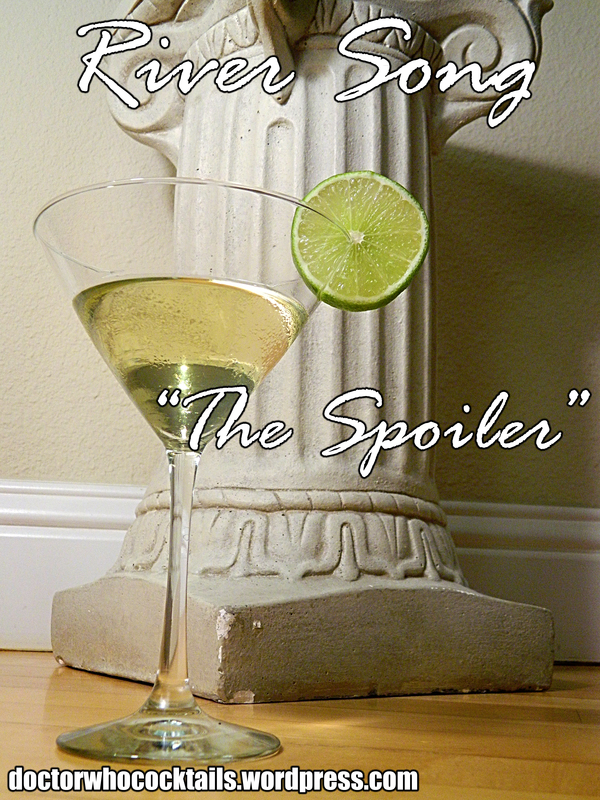 Add all ingredients to a mixer filled with ice, shake well, serve up or on the rocks with a lime wheel garnish. *Optional: Squeeze a fresh lime instead of adding lime juice. 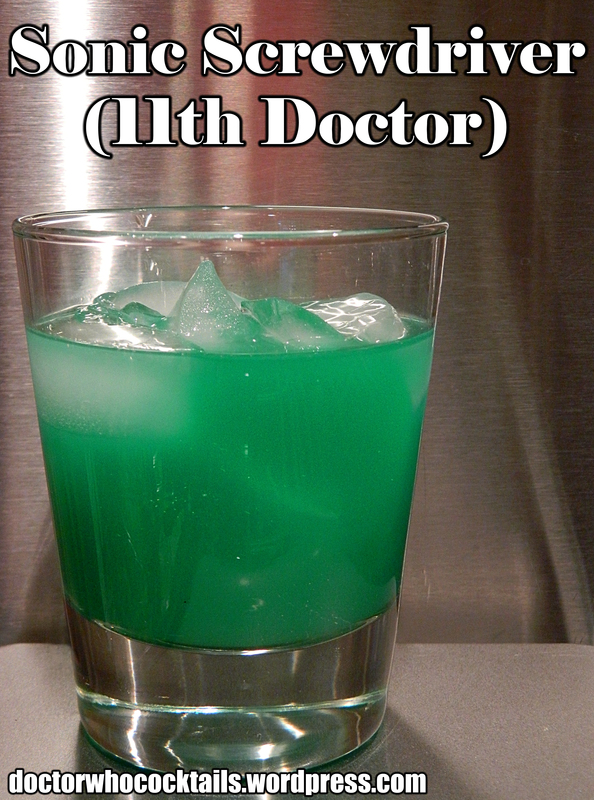 Smooth, pleasant, with a dash of darkness, this cocktail recalls the glory days of The Master during his first regeneration cycle; You aren’t sure if it’s your friend or your enemy, but you keep indulging anyway. 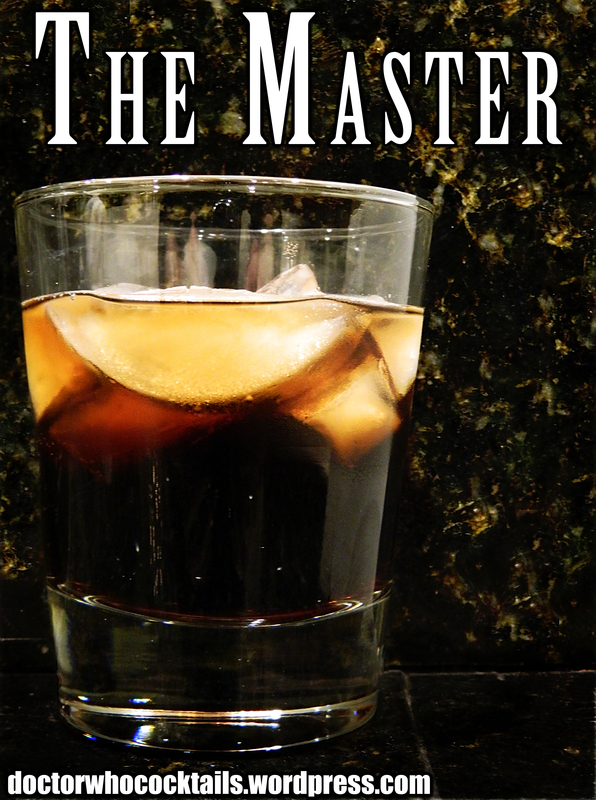 The Master is The Doctor’s archenemy, a renegade Time Lord bent on becoming “the master of all matter.” A master of disguise and deceit, he is a persistent foe of The Doctor’s, always managing to escape and return with a new plan. He first appears in the series at the end of his regeneration cycle, scheming and elegantly evil. He is eventually forced to appear as a emaciated husk while he attempts to renew his regeneration cycle at the end of his final regeneration. He does manage to succeed in taking over the mind of a Trakenite named Tremas, whose body he wears until he is put on trial and executed by the Daleks (yes, even the Daleks found his crimes to be too evil). The Doctor is then charged with the transport of The Master’s remains from Skaro to Gallifrey, wherein The Master manages to maintain sentience in the form of an ooze (presumably his remains), which crashes the TARDIS. He manages to steal yet another body which is eventually sucked into the Eye of Harmony. Years later, unbeknownst to The Doctor, the Time Lords resurrected The Master in order to make him the ultimate soldier in the Time War, from which he fled and disguised himself as a human on Earth. After finally opening the fob watch which restores his Time Lord DNA, he once again is able to roam the universe in his quest to rule, now a rather deranged man willing to stop at nothing to get his way. 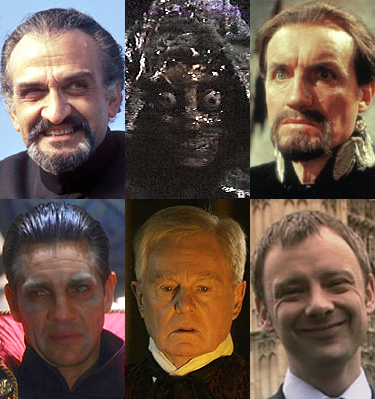 The Master was written for and originally portrayed by Roger Delgado, who debuted the role in 1971 and played it until his unexpected death in 1973 (prompting the departure of Jon Pertwee’s 3rd Doctor, as they were old friends and Pertwee was devastated). Under heavy make-up, the Master was portrayed in “husk” form by both Peter Pratt (1976) and Geoffrey Beavers (1981), and as a mind-controlled Trakenite by Anthony Ainley, who played it until the eventually hiatus of the original series in 1989. As the possessed paramedic, Eric Roberts portrays The Master in the TV Film (1996), and in the revived series, The Master is reintroduced in human form by Derek Jacobi (2007) before John Simm took over the reigns for the rest of his New Who appearances (2007-2010). A classic cocktail with a sonic twist, because we’re not the first people to look at a screwdriver and say “This could be a little more sonic!” We prefer the whiskey/orange combo of flavors, but if you’re a stickler here’s a darn good vodka-based version. Add all ingredients to a shaker filled with ice, shake well, strain or pour into a highball glass. 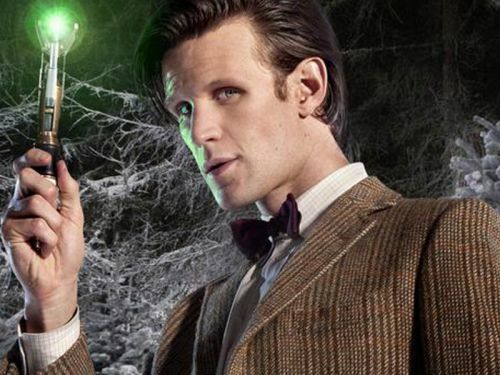 The sonic screwdriver has been The Doctor’s multi-tool since his 2nd incarnation. Used as a lock pick, a scanner, and even sometimes as a classic screwdriver, it uses sonic waves to read and manipulate matter. The only thing not to love is that it doesn’t work on wood! The 11th incarnation of The Doctor has the largest sonic to date, with a pop-out tip and more capabilities than any sonic before it. The Exterminator — yummy and deadly! 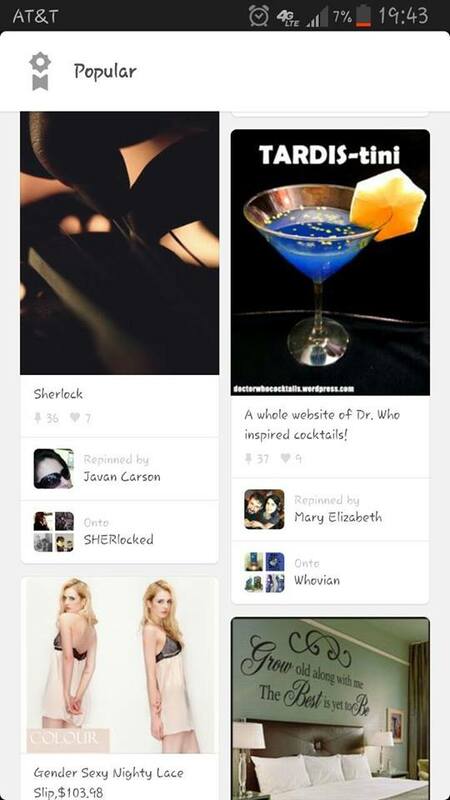 Kick back, explore, and please use the social links to your left to stay in the loop. We put out videos every now and again, and love chatting with fans on Facebook and Twitter about what drink should come next. That’s your chance to tell us what you’d like to see next on the menu, so we hope you’ll be in touch!